The final two instalments of Wael Shawky's epic trilogy Cabaret Crusades will be screened at Kunsthaus Bregenz in Austria from 16 July until 23 October 2016. Inspired by the writings of French-Lebanese author Amin Maalouf, Shawky's Cabaret Crusades tells the story of the Crusades from an Arab perspective, creating a meta narrative on the universal dilemma of 'the other'. Through marionettes clad in Oriental dress, the films recount the history of the medieval clash of religions that lasted two centuries and explores the false belief of a single historical truth. Drawing on choral music, popular science, the nativity and the horror genre as a source of inspiration, The Path to Cairo (2012), the second part of Shawky's trilogy, almost half a century between the First and Second Crusades, from 1099 to 1146. Shot using 120 clay figurines handmade by the artist, the film creates a mythical and surreal atmosphere that blends drama and cynicism, where grotesque puppets become a metaphor for the inevitable power networks inherent in the construction of history. The Secrets of Karbala, the last sequence in the trilogy, will also be on view. This film tells the story of the Second (1145 - 1149) and Third (1189 - 1192) crusades, which ended in 1204 with the destruction of Constantinople. Shawky's attention here is not merely based on the power struggle between two religions, but also shows the onset of the schism between Shiite and Sunni Muslims. 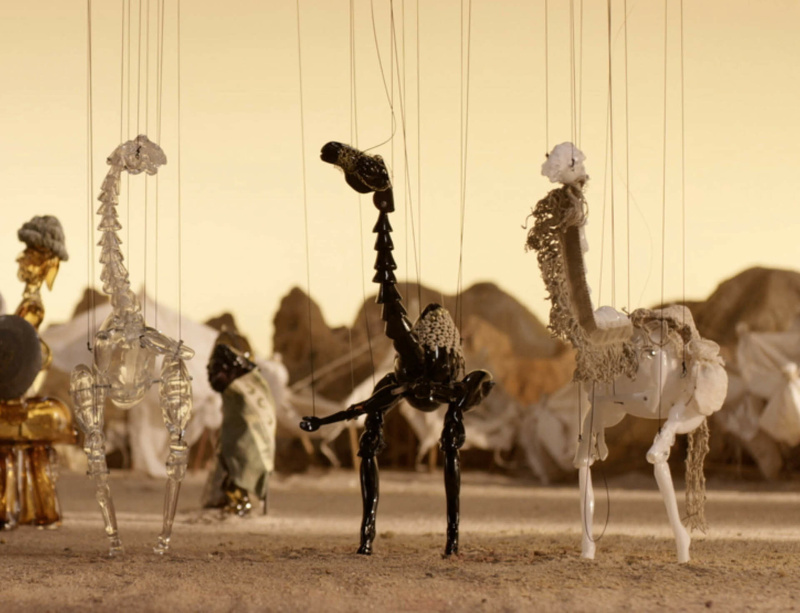 Scenes in the film have been created through the use of hand-blown glass marionettes, some half-human, half-animal beings, and are accompanied by a compilation of the songs of Arabian pearl fishers and Egyptian electronic music. The exhibition at Kunsthaus Bregenz will also include four glass panels depicting a historical map of the Orient, adjacent to a 'flying object' which is both a metaphor for the 9/11 attacks and the Hajj pilgrimage to Mecca. Also on display will be an installation that depicts a replication of the film sets with some static ceramic and glass marionettes, alongside drawings and flags installed both inside the museum and on the building's exterior. More information on the exhibition at Kunsthaus Bregenz is available here.